08.11 THE KLINIK + THE NEON JUDGEMENT @ De Casino - SOLD OUT !!! We are proud to say that the double bill night with THE KLINIK & THE NEON JUDGEMENT at De Casino (St-Niklaas, B) is now completely sold out! Check our own Facebook event to see who else is going! 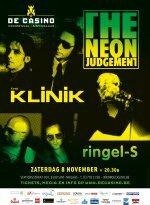 08.11 THE KLINIK + THE NEON JUDGEMENT @ De Casino - LAST 50 Tickets!!! Looks like the double bill night with THE KLINIK & THE NEON JUDGEMENT at De Casino (St-Niklaas, B) will sell out any day now! If you didn't order your tickets yet you better hurry up and click the link below! Only 50 tickets are still available! Don't say we didn't warn you! This The Klinik box set is not only the most comprehensive anthology of the band's music ever released, it is also an important documentation of a vital piece of history of electronic music. On 8 CDs, it not only contains all album releases of yore (with the exception of the comeback release from 2013), but also all rare and out-of-print tracks, plus a plethora of unreleased studio and live recordings. Belgian band The Klinik is one of the few artists that have managed to leave a lasting imprint on an entire scene. Many of today's protagonists would simply not exist in their current form had it not been for the influence of this seminal group. More than three decades ago, Marc Verhaeghen and Dirk Ivens created a completely new sub-genre in electronic music, by consequently combining minimal, cold, dark and raw Industrial-elements to create a sound that was completely unique and had never been achieved in this form before. Tracks like “Memories”, “Moving Hands” or “Black Leather” are still mandatory spins at Dark-Electro-clubs around the globe and will instantaneously fill any dance floor. With their fresh and new style of music and their enigmatic live shows that see the band members dressed in long black leather coats and wrapped in medical bandages, The Klinik quickly became a cult act in a steadily growing scene. Hissing vocals and minimalist lyrics were accompanied by strange and creative synthesizer sounds, noises, bare bones beats and distorted trumpet which altogether gave the music a fever-dream-like quality. 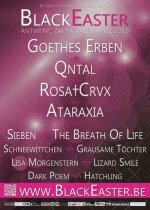 The Klinik were not only mere electronic music, they were a unique experience and a way of life. It is hardly any wonder that many of today's popular acts still quote the group as one of their main influences. The song “Out Of Line” from the album classic “Face To Face” was also inspiration for the name and the creation of the label that is now releasing this very box set. “The Klinik-Box” contains 8 jam-packed CDs which include all the studio albums the band has released, all EPs and all other rare and out-of-print-material. On top of that, The Klinik have unearthed a myriad of previously unreleased studio and live recordings which have also been included. All recordings have been remastered with a lot of loving care by Eric van Wonterghem (Dirk's colleague in Absolute Body Control) under supervision from the band, to let them shine in a previously unheard sound quality. The set is limited to 1000 hand-numbered copies in a lavish book box. This box set is not only a dream come true but also a true affair of the heart for all that were involved in creating it… and an absolute must-own for fans. This Holy Grail of the Electro-Industrial-scene should be in every decent collection of alternative electronic music! The last (but certainly not the least) 4 bands confirmed for Black Easter Fest! Find out more about these bands right here! Our venue has limited capacity, so order your tickets today and save some money on top!! Note: Early bird tickets are only available for the entire festival, not per day! Parade Ground's complete career summarizing sampler on the prestigious 'Classic Series' by Infacted Recordings! Parade Ground's complete career summarizing sampler is now released on CD und the well known title „Strange World“ on the prestigious 'Classic Series' by Infacted Recordings! Writers and composers for brother-band Front 242, Parade Ground really are masters in melodies through all kinds of electronic music , with the unique voice of Jean-Marc Pauly. The completely remastered songs feature rare , unreleased , and live tracks to make „Strange World“ the ultimate collectors release for all EBM and "Parade Ground" fans! Click the link to read the review on Peek-a-Boo Magazine!